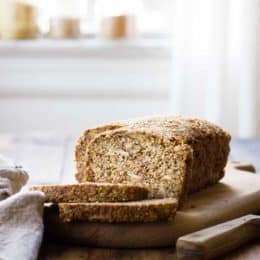 Packed with whole grains and seeds yet still springy and light, this multi-grain sandwich bread comes together with a minimum of fuss. While few aromas are as tantalizing as a loaf of buttery white bread emerging from the oven (right up there with bacon frying and coffee percolating; if you do it right, you can have all three at once!) some of us who grew up with health-obsessed parents have a hard time gorging on the fluffy white stuff. But we still crave the chewy compressability of a loaf of tender pan bread. Though rustic, artisan-style breads are currently all the rage, pan bread is ideal for making sandwiches from its uniform slices. And although I abhorred the brown stuff my mom used to send in my (paper) lunch bag, wrapped around (nitrate-free) (organic) turkey and (canola oil) mayonnaise, I now find myself packing similar lunches for myself. 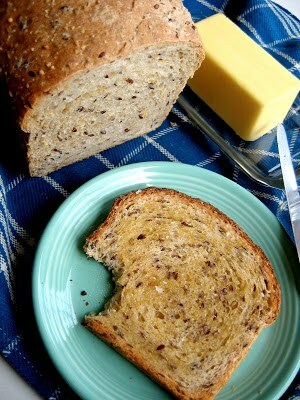 For several years I have been searching for a great whole-grain pan bread recipe. 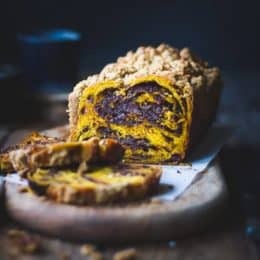 The ideal recipe would be quick and simple to put together, bake up tall in the pan, have a decent amount of butter, salt and sweetener to give it flavor, and have a light and delicate texture flecked with a hefty dose of whole grains and seeds. We ate this at an awesome retreat center in British Columbia. 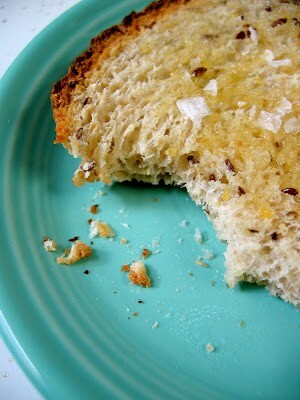 The bread is delicious, but a bit more squat, heavy, crumbly and dark in color than I was after. Perhaps I oughtn’t have taken advice from a novel, but this bread was disastrous: leaden and sandy textured from the grains, and bland to boot. This bread tasted great, but was super labor intensive and time consuming, with a bit of sourdough starter, lots of time, and a ton of ingredients. The dough was also a huge amount for the standard sized loaf pan. Very close to perfection: light, tasty, quick, but also huge for the pan. I considered decreasing the recipe by 1/3 or so, but my mind boggled at the math required. It didn’t actually call for whole grains, but whole rye flour, so it was less grainy than I wanted. Molly Katzen, you are my hero! This was my favorite thus far, and my recipe is based on its proportions. Millet is steamed, then mixed with salt, butter and honey and allowed to cool. Meanwhile, a sponge is made. The two are combined, more water and flour are added, and the bread does its thing. It baked up soft, grainy, full flavored and golden. I had some 10 grain cereal mix in the cupboard that needed using, so I began experimenting with the Moosewood recipe. Rather than steaming the grains, which requires cleaning an extra pot (which you know I don’t enjoy doing) I covered the mix with boiling water. I added butter and honey to the mixture and let it cool down to just warm. The grains softened up nicely, leaving enough water to which I added flour, salt, yeast and flaxseed. I kneaded the dough, let it rise, rolled it into a loaf. Another rise and a bake yielded just the sort of bread I was looking for. I made 5 more loaves, tweaking the flavorings, trying various grains, and using different ratios of white and whole wheat bread flours. This is the version I came up with. I don’t want to use the ‘p’ word, but I will say that I am quite happy with it, and can’t stop toasting it for breakfast, layering it with tomatoes, cheese, turkey and sprouts for lunch, or dipping it into soups for dinner. The bread is mixed using the straight dough method which means everything goes straight into one bowl. You can easily knead it by hand, and you get only a spoon, a bowl and your counter dirty. Grainy doughs can be a bit sticky, so be sure your surface and hands are dusted with a bit of flour as you knead.The softer the dough (i.e. the less flour you add) the more open and springy your bread will be, so use the barest amount you can to prevent stickage. The dough should still be a bit tacky to the touch when you’ve finished kneading it, but not so wet as to be sticking gooily to your hands and the counter. A plastic bench scraper is my best friend for hand-kneading sticky doughs (or any dough). You can experiment with using other whole grains or a multi-grain cereal mix in place of the millet, oats and polenta; just grind anything you like to the size of a coarse meal. 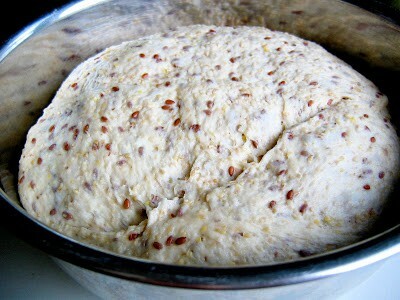 Try using sunflower, sesame or poppy seeds in place of the flax. I like the way the little yellow flecks of polenta add a splash of color, contrasting with the deep brown ovals of flax and the crust, and the warm beige of the bread itself. I love using fresh cake yeast, with its bizarre, crumbly texture and rapidly rising nature. You can buy it at Rainbow Grocery in San Francisco. Instant yeast is an easy substitute; use 1/3 the volume of the fresh yeast called for. Active dry yeast will need to sit for 10 minutes after being whisked into the warm water/grain mixture, but it can be used as well. Quite honestly, the best sandwich bread out there! Uncover the bowl and scrape the dough out onto a lightly floured surface. Knead the dough, dusting your hands and surface with just enough flour to keep it from sticking, for about 10 minutes. The dough should feel smoother by the end, and should be a bit tacky but not sticking to things. 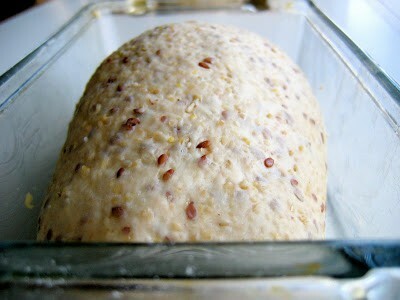 Round the dough into a boule and place in a large bowl coated lightly with oil. Turn to coat the dough with oil and leave the boule smooth side up. Cover the bowl with plastic wrap, and leave to rise until doubled in bulk, 1 - 2 hours. Grease an 8x4" or 9x5" loaf pan with butter. Turn the dough out onto a surface dusted very lightly with a bit of flour. (A plastic scraper works wonderfully for this.) Pat the dough into a rectangle roughly 8x14", with a skinny side facing you. Roll the dough up snugly, cinnamon bun-style,and pinch the seam shut. Tuck the ends under the loafand roll the log a few times, seam side down, to smooth it out. Place the log, seam side down, in the greased pan, and put the whole shebang into a large plastic vegetable bag (or small garbage bag). Tie the end of the bag shut, leaving it inflated to give the loaf room to expand. Position a rack in the lower third of the oven and preheat to 400º. If you have a baking stone, put that on the rack. Place a metal or cast iron pan that you don't care about on the floor of the oven. You will put ice cubes in it to steam the oven, and it will become rusted and nasty. Remove the bag. Fill a 1/2 cup measure with ice cubes. Open the oven and quickly but gently place the loaf pan on the baking stone, and toss the ice cubes into the pan on the floor of the oven. Close the door and don't open it again for 20 minutes. After 20 minutes, reduce the oven to 350º. Rotate the pan and bake the loaf for 30 - 40 more minutes, for a total baking time of 50 - 60 minutes. A thermometer inserted into the center of the loaf should register 195 - 200º. Optionally, for an extra-crisp crust, remove the loaf from the pan after 45 minutes and finish baking directly on the stone. Remove the loaf from the pan and let cool completely before cutting (the internal steam is continuing to cook the interior of the bread) 1 - 2 hours. Store the bread in a plastic bag or other airtight container at room temperature for up to a week. 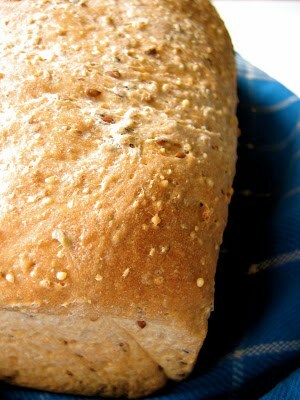 This is a straightforward, user-friendly, multi-grain bread recipe, an excellent place to start for the yeast-phobic. If you prefer, you can substitute any multi-grain hot cereal blend for the millet, oats and polenta. Nutritional values are based on one of ten servings. Round the dough into a boule and place in a large bowl coated lightly with oil. Turn to coat the dough with oil and leave the boule smooth side up. Cover the bowl with plastic wrap, and leave to rise until doubled in bulk, 1 – 2 hours. 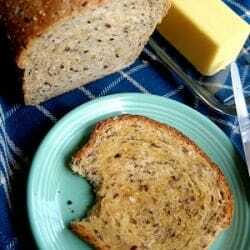 Grease an 8×4″ or 9×5″ loaf pan with butter. Turn the dough out onto a surface dusted very lightly with a bit of flour. (A plastic scraper works wonderfully for this.) Pat the dough into a rectangle roughly 8×14″, with a skinny side facing you. Roll the dough up snugly, cinnamon bun-style,and pinch the seam shut. Tuck the ends under the loafand roll the log a few times, seam side down, to smooth it out. Place the log, seam side down, in the greased pan, and put the whole shebang into a large plastic vegetable bag (or small garbage bag). Tie the end of the bag shut, leaving it inflated to give the loaf room to expand. Position a rack in the lower third of the oven and preheat to 400º. If you have a baking stone, put that on the rack. Place a metal or cast iron pan that you don’t care about on the floor of the oven. You will put ice cubes in it to steam the oven, and it will become rusted and nasty. Remove the bag. Fill a 1/2 cup measure with ice cubes. Open the oven and quickly but gently place the loaf pan on the baking stone, and toss the ice cubes into the pan on the floor of the oven. Close the door and don’t open it again for 20 minutes. After 20 minutes, reduce the oven to 350º. Rotate the pan and bake the loaf for 30 – 40 more minutes, for a total baking time of 50 – 60 minutes. A thermometer inserted into the center of the loaf should register 195 – 200º. Optionally, for an extra-crisp crust, remove the loaf from the pan after 45 minutes and finish baking directly on the stone. Remove the loaf from the pan and let cool completely before cutting (the internal steam is continuing to cook the interior of the bread) 1 – 2 hours. 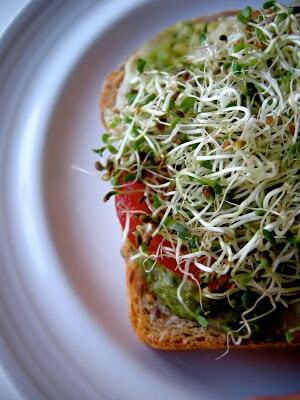 I put coarse-ground cornmeal and steel-cut oats into my sandwich bread too! I love the texture it provides. Also, whole rolled oats. Seeing as how I was already planning on making sandwich bread today (yesterday was olive/rosemary/walnut, but we ate it all), I shall have to try this one out. Sounds perfect. I have been meaning to make bread for awhile and this may just be the inspiration I need. That said, I really appreciate the descriptions of the correct textures at the different stages. It's quite useful. So I've been making this bread for about three months now and the flavor never seems to get old. I've yet to find millet in an LA supermarket, so I keep substituting bulgar wheat, and everything keeps coming out just fine. It really is an exquisite loaf. Thanks so much! I love this recipe! Bread is my favorite, but I often find that recipes are too challenging or make too much (I really don't have space or resources), so this was perfect. Your notes on the textures were great because I actually knew what to look for. I too did not have/can't easily get any millet. The first time I made it I substituted couscous (my theory was that millet and couscous looked similar… not my finest moment), but it still turned out really well! I am just finishing up my second showing and I used wheat bran instead of the millet this time and it smells delicious! 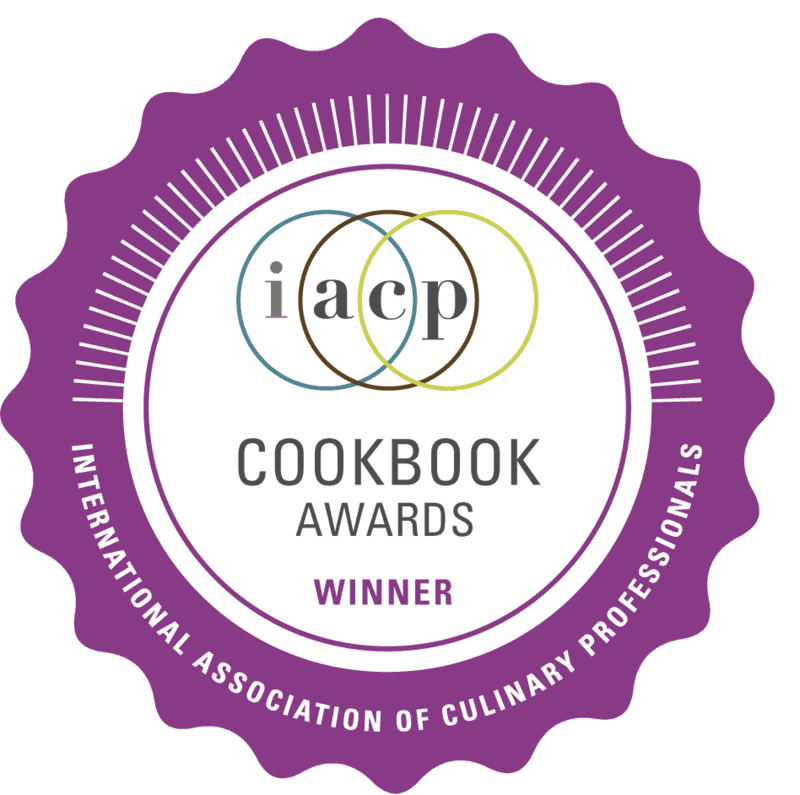 Thanks for the inspiration and writing a great recipe! Thanks Vicky – I'm so glad you like it! Hi Alanna! Thanks for the great recipe! I tried this bread recipe today, and my husband and I both love it. I made a few substitutions that turned out perfectly. I used coarse cornmeal, rolled oats instead of steel cut and I added oat bran. I'm so pleased with how it turned out. This is my first time to your blog and I'm looking forward to reading more. I used Bob's Red Mill 10 grain cereal in place of the other grains and it turned out fantastic. The best whole grain bread I've had in a long time. My 20 month old loves it too! Hi Alanna! I'm excited to try this recipe but I have a question! The ingredients say 2C white flour but the instructions say 1 1/4C. Is that just a check point and you continue to add flour until you've reached 2C? I'm new to bread baking so I don't have it quite down yet! Thank you! Do you think whole wheat pastry flour could work in place of the white flour? 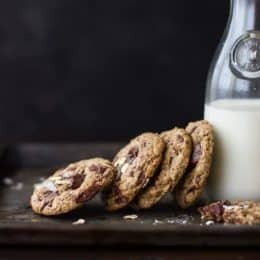 Can I use sourdough starter in this recipe? If so how does it change the flour ratio? This bread looks absolutely amazing! I want to try it so bad but I’m trying to stay away from wheat flours. I’m new to gluten free cooking. Is there any way to substitute other gluten free flours without sacrificing the height? 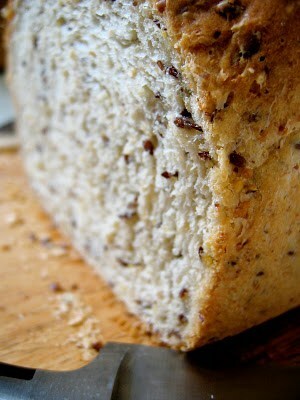 Other gluten free breads I have tried making are very short and not very sandwich friendly in that regard. Thanks! Hi Amanda! This is such a great question. GF bread baking is no easy feat, and I have yet to brave a fluffy whole grain sandwich bread like this one, though I’d like to! 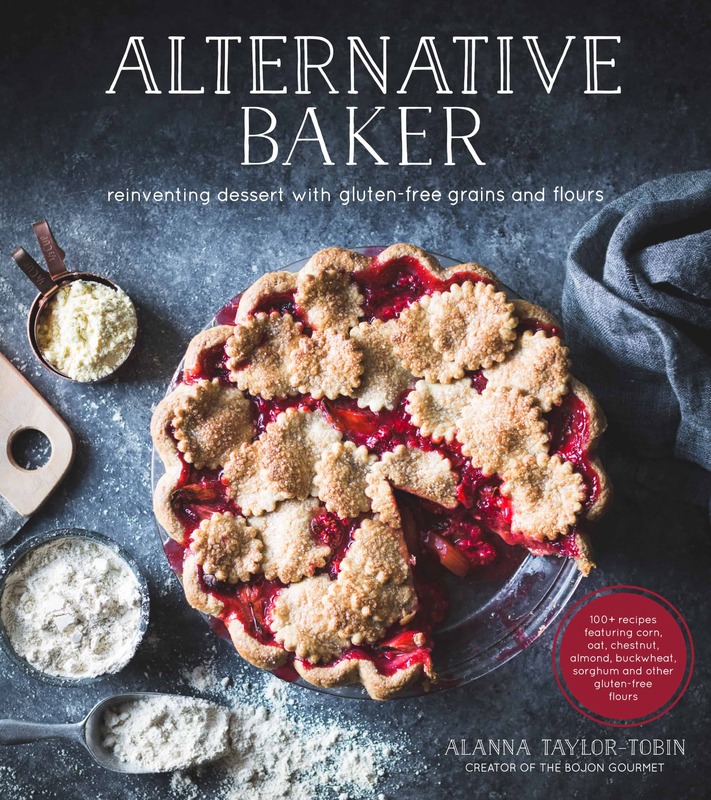 There’s a bread recipe in my friend Sam’s book Gluten-Free for Good that I’ve been meaning to try – I wrote about the book here and shared a delicious crisp recipe from it. 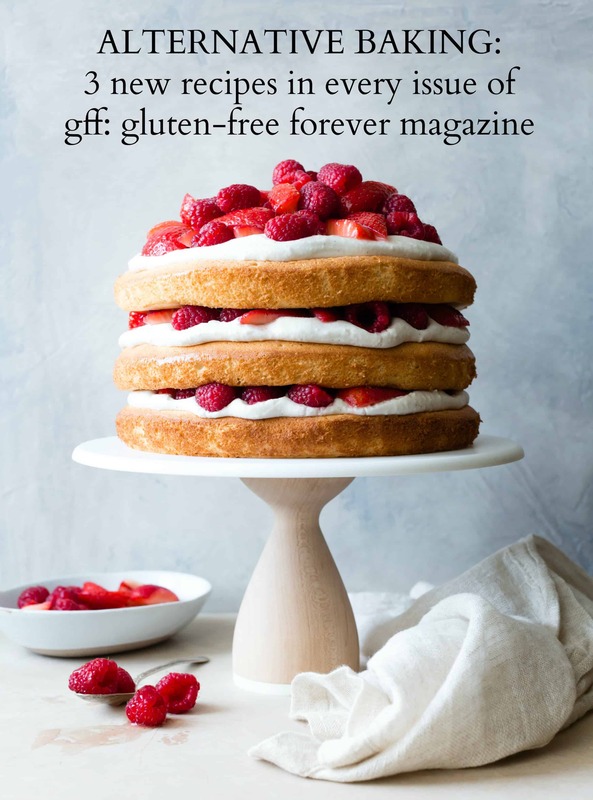 FYI there are now loads of GF recipes on my site and also in my cookbook! Can this bread recipe be cooked in a cast iron Dutch oven? I’m not sure as I’ve never tried, but I’d guess the dough would be sturdy enough? Let me know if you try! So glad you love it! My favorite way to store bread is to cut the baked bread into slices, double bag them, and freeze. They keep for a month or two, and you can just pull slices out as needed – you’ll want to toast them of course. Alternatively you can freeze a whole loaf and just defrost it when you’re ready to eat it. Let me know what you end up trying! Just made this recipe and LOVE it ! Can I freeze the loaf before the last rise ? Have you ever done this ? I’d love to be able to take one out and bake it to give with soup or something as a gift to a neighbor. Thanks for your helpful advice :) Barb. I’ve never tried this and don’t know how it would work. You might be better off freezing it after baking – I do this with bread all the time and it works great! It’s a type of corn meal. Made this for the first time yesterday and it turned out exactly as I wanted. Light and delicious with a great texture! So out of curiosity, how does the recipe do if I double it? am I better just to make 2 batches? It would be great if I could do 2 loaves at once. I have made this bread many times and love it. It always turns out great. I am trying to stay away from so much white flour so wondering if you have tried it with less white and more of other flours without hurting the texture? This sounds interesting. Since you said “You can experiment with using other whole grains” I had this weird brainfart: how about using grains that would be used for beer brewing? I love beer, and I put those grains in my sourdough bread, but sandwhich bread? I wonder if it would make it too heavy? I picked some up yesterday and the homebrew store (three malted grains and barley flakes) and had them run the mix through their grinder. I have a flour grinder, so I can make them even finer. I still have sourdough to finish up, but I’ll try to make this bread this week. What do you think? I know what’s polenta.. I meant do you mean the actual cooked one or the corn flour? I have an electric oven so I cannot put a pan on the bottom of my oven. Can I use a cookie sheet of ice on the lowest rack and bake the bread on the next rack? What happens if the bread is not steamed like this?